"As you can see, there's a whole lotta stuff to do before school starts this fall! So stick with us, cause Phineas and Ferb are gonna do it all!" Ferb, I know what we're gonna do today. Describe our own TV Tropes page! Phineas Flynn and Ferb Fletcher are two open-minded and kind-hearted stepbrothers who live in the town of Danville. 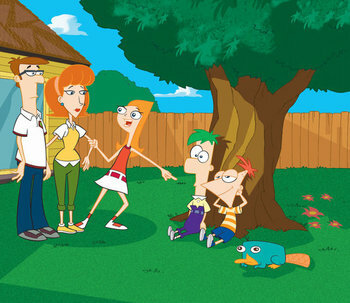 Their family consists of their older sister Candace, Linda (Phineas and Candace's mom), Lawrence (Ferb's dad) and their pet platypus Perry. Phineas is ridiculously smart and full of energy; Ferb is equally smart, although he's a little bit more quiet. Oh, and Perry is a secret agent for an international organization of animal super spies, but that's neither here nor there. The brothers find themselves dissatisfied with just spending their summer vacation outside of school, so they pull off unbelievable and often outlandish stunts (i.e. visiting the moon, building a roller coaster, entering a race car competition, rediscovering the dodo bird, giving a monkey a shower, etc.) in order to make summer more exciting. They do a bit of charity whenever they can, and often even manage to make their school's resident bully and his victim work together. But don't worry — the show never gets preachy. It just has really cool songs instead. Candace hates the fact that her brothers can get away with ''anything''. So Once an Episode, she tries to tell their mom about what the boys have been up to. However, their actions are always covered up just in time, often due to Perry fighting an evil scientist named Dr. Doofenshmirtz, whose inventions have a tendency by sheer coincidence to erase all evidence of whatever the boys have built. This not only causes their mother to question Candace's sanity every time, but also neatly ensures the continuity of the series. Co-creator Dan Povenmire had been pitching early versions of this show even before joining the Family Guy crew, where he wrote and directed the first "Road to..." episodes. Its fresh take on summer vacation stories, along with its numerous string of running gags, clever writing, and at least one new musical number per episode has made the show Disney Channel's most successful original animated series of all time. It was one of the few Disney animated series to hit the 100-episode mark. In May 2015, the creators announced that production on the show had ended. The Series Finale, titled "Last Day of Summer", aired on June 12, 2015, wrapping up an eight-year run, the second longest running animated series in Disney history. In addition, a stand-alone special, "The O.W.C.A. Files. ", premiered on November 9, later that year. The show's crew is currently working on a new animated series for Disney XD titled Milo Murphy's Law, which premiered on October 3rd, 2016. Milo's second season premiere, "The Phineas and Ferb Effect", is a crossover episode between the two shows. Since that point, Dr. Doofenshmirtz has joined Milo's main cast, with various other Phineas characters, especially Perry, making guest appearances. On April 11, 2019, Disney announced that an animated movie based on the show is in development for their upcoming streaming service, Disney+. It is expected to release within a year of Disney+ launch date of November 12, 2019. Interestingly enough, the series is connected to the Disney Channel Live-Action Universe through a series of convoluted crossovers, but was never officially linked to the DCLAU.